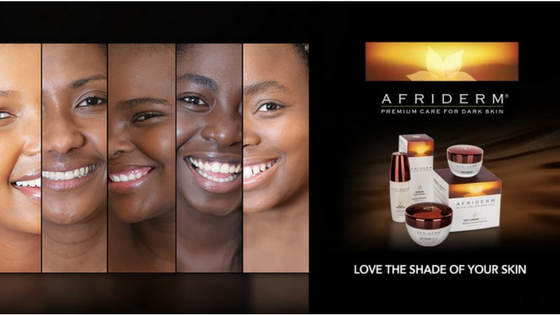 Afriderm, premium skincare for dark skin. I first bumped into this brand while waiting in line to pay for products at Edgars. I’m not really sure what it is that caught my eye and made me think “I’ve gotta have that“. I think at first it was the elegant and luxurious packaging. And once I picked it up it was definitely the words “dark skin“. I had to have that! I’m assuming that you, like me, aren’t really familiar with Afriderm. Before walking into Edgars to make my purchase I had no idea what it was. Now that I have tried out some products from the brand I am sad I hadn’t bumped into it earlier, it’s an amazing brand! A brand that cares about melanin and all things beautiful and glowing under the sun. What’s there not to love? 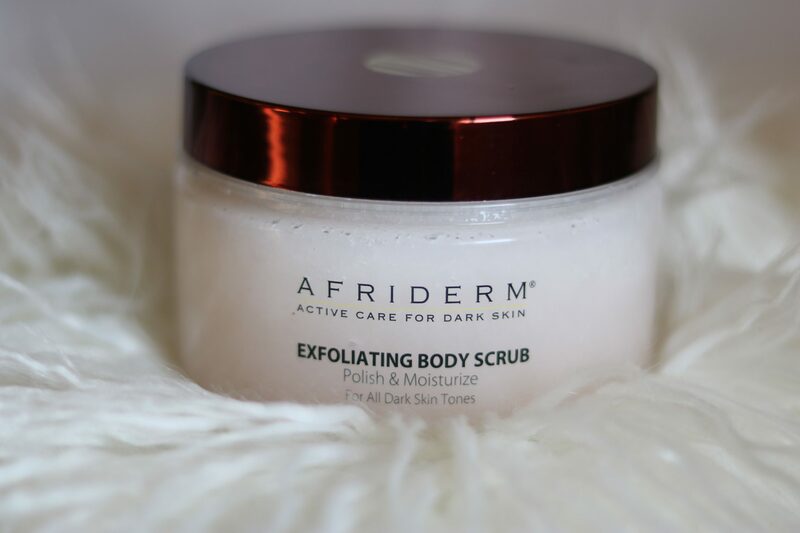 Afriderm focuses on tackling (specifically) dark skin problems such as uneven skin tone, infections and blemishes, ance and ashy skin. 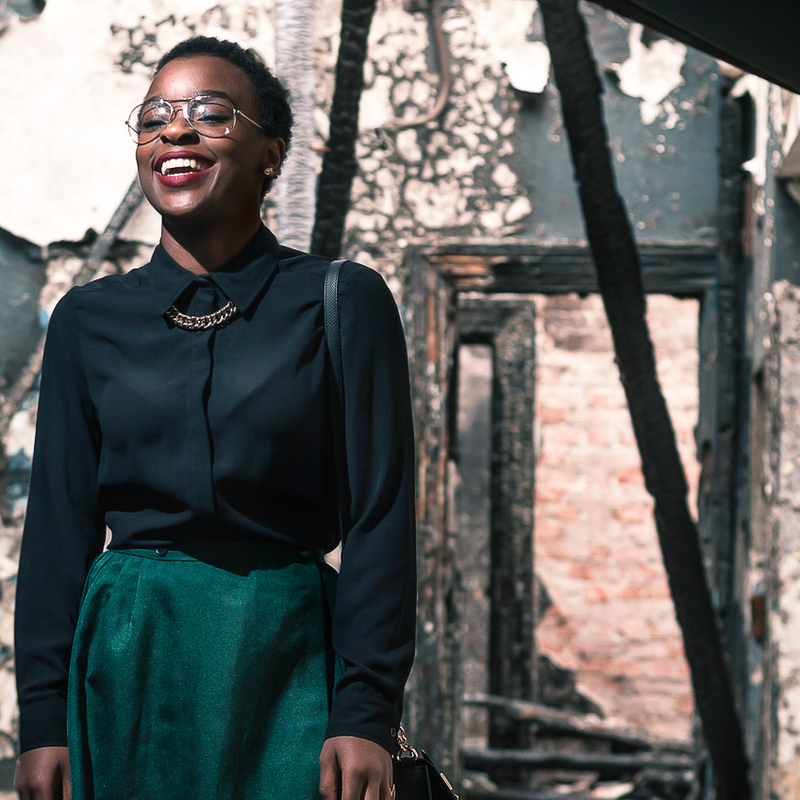 Dark skin has more melanocytes cells (that produce melanosomes, which produce melanin) than lighter skin, which makes it more prone to such problems than any other skin type. Afriderm claims to have the answer! The first product I purchased from the brand was the body butter. I didn’t quite know what to expect from the brand so I didn’t want to go ham and purchase everything all at once. When I got home immediately put it to use. I took my evening shower and smothered this luxurious, beautiful butter all over my body. I have been a changed woman since. The first thing that caught my attention when I opened up the butter was the beautiful smell and non-oiliness. I had assumed that since it was for ashy skin that it would have some sort of oily feel or texture to it and I could not have been further from the truth. It is fast absorbing and leaves you feeling moisturized and ash-free (and it smells amazing too). Some of the main ingredients used in Afriderm products are octadecanoic acid, lilac extract (syringa vulgaris), sodium lactate and potassium lactate. All these products were specially chosen to ensure that your beautiful melanin-rich skin is left as moisturized, pigment-free and moisturized as possible. The main ingredient in the body butter is sodium lactate. It is one of nature’s most powerful hydrators and enables your dark skin to revitalize itself. Other ingredients in the butter are shea butter (hello, who doesn’t love a good dose of shea butter after a relaxing shower? ), coenzyme Q10 and botanical extracts. In short, it’s bomb! The second product I decided to head out and buy after trying the luxurious body butter was the equally as luxurious and super effective exfoliating body scrub. Now we all know I love my body scrubs and this one has definitely been added to my list of favorites. It polishes and moisturizes all in one without leaving your skin stripped and dry. The very first thing I noticed when I exfoliated my skin was just how smooth and moisturized my skin felt. Is the word moisturized starting to look weird to you? Because it’s starting to look weird to me lol. Honestly, the first thought that you should think about from now on when someone mentions Afriderm is moisture! It works hunny. 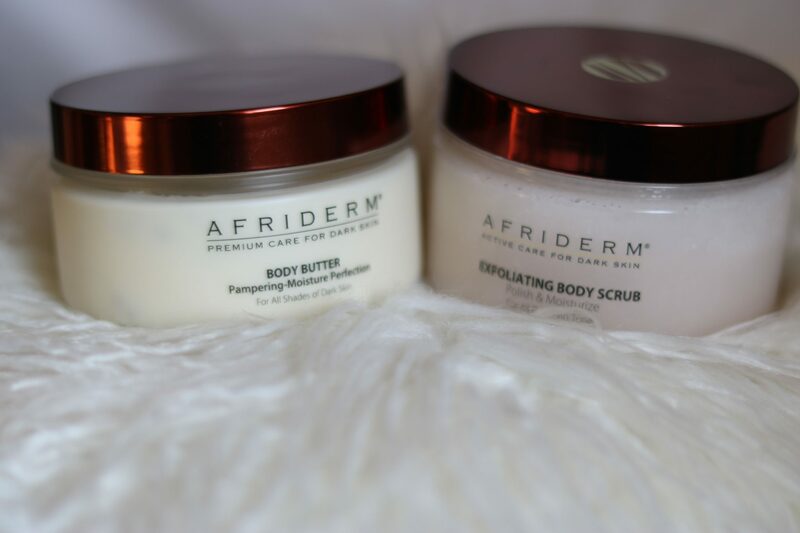 Used together, the Afriderm body butter and exfoliating body scrub are a match made in heaven. If you are looking for a combo that not only leaves you feeling clean but also beautiful and happy with your melanin-rich skin then this is it. 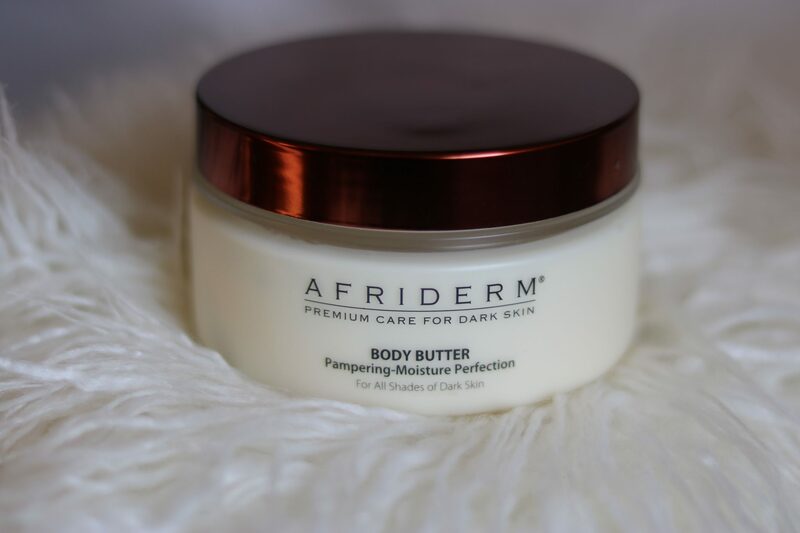 Afriderm has done an incredible job at ensuring that the ingredients used are catered towards dark skin and meeting its unique skin needs. Unfortunately the Walmer Park Edgars I bought these products in does not have the facial care range but I will definitely be on the hunt for those products too. Previous Post What Are Sulfates? Are Sulfates Bad for Your Hair? I’ve always wondered about these Afriderm products. I haven’t tried any of them before but I think I may give the body butter a try once my body products are done.